ST. GEORGE — St. George Police are asking the public’s help in locating a missing and endangered man. 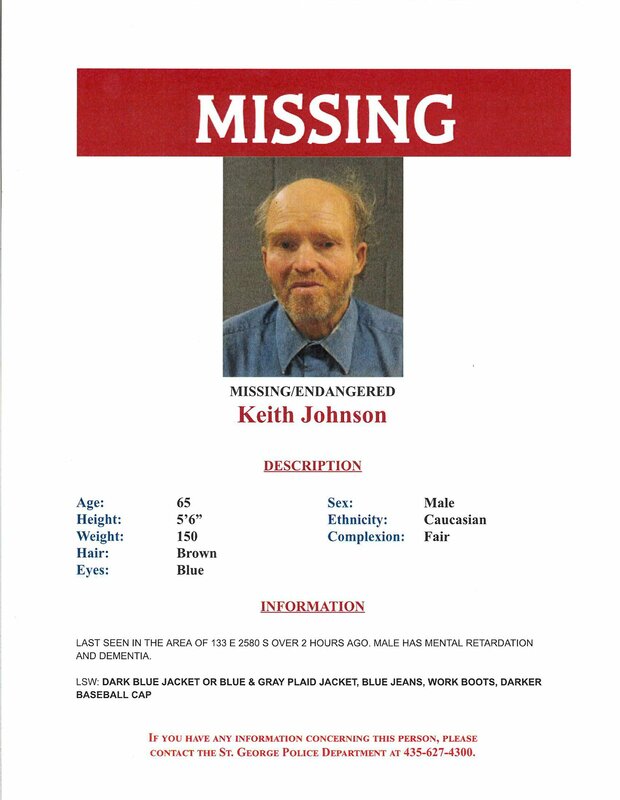 Missing poster for 65-year-old Keith Johnson who went missing in St. George, Monday, Jan. 22, 2018 | Image courtesy of St. George Police Department, St. George New. Updated 3 p.m. St. George Police confirmed Monday afternoon that Keith Johnson has been found. Police describe 65-year-old Keith Johnson as developmentally disabled and suffering from dementia. He was last seen over two hours ago in the area of 133 E. 2580 South in St. George. Police said Johnson likes to head toward the Hurricane area. He was last seen wearing either a dark blue jacket or blue and gray plaid jacket with blue jeans, work boots and a dark-colored baseball cap. Johnson is white and described as 5 feet 6 inches tall, weighing 150 pounds and having brown hair, blue eyes and fair complexion. Johnson previously went missing Dec. 8, 2017, and was found safe about three hours later. Missing since: Jan. 22, 2018. Missing from: 133 E. 2580 S., St. George. Height: 5 foot 6 inches. Anyone who seen the man or has information about his whereabouts is asked to call the St. George Police. Department at 435-627-4300.